It is our pleasure to welcome you, the professional make-up artist, to the world of Kryolan and our PRO CARD program. Are you looking for a place where you can find everything that you need for your highly diversified work, in your city, in your country, or wherever you may find yourself in the world? Is it important that you have access at all times to reliable, well-known products, and to be able to shop for them without hassle? You can find Kryolan in more than 90 countries and on all continents of the world, in which you can obtain an extensive assortment of professional Kryolan make-up products. Trained specialist staff is at your service to provide you with professional knowledge and advice at all times. We want you, as a make-up artist, to be recognized as a loyal Kryolan customer as soon as you step into a participating PRO CARD store. 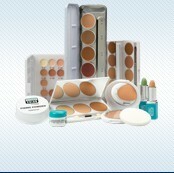 Therefore, we offer you our new Kryolan PRO CARD and hope that you will enjoy its benefits while shopping with Kryolan.